The improvement of fire safety is a development that has been going on for ages. Fire doors are important for fire safety by protecting escape routes and stopping the spreading of fire. At the moment, the requirements and quality of fire doors differ per country in Europe. In 2014 a new European standard was introduced to make the legislation and regulations for fire doors uniform in Europe. Only an EN standard is not enough to ensure uniform regulation within the borders of Europe. To achieve this, the CE marking for fire doors must be made obligatory. In this blog we will give information about this procedure and its consequences. The EN standards are tested and classified in the same way within each Member State, which means that a minimum quality standard is required throughout Europe. If the standard is mandatory, a product with a specific characteristic from the standard must have a CE marking. CE stands for Conformité Européenne, which means 'in accordance with European regulations'. A manufacturer guarantees with a CE mark, just as with an EN standard, that its product meets certain safety requirements within Europe. As a result, products with CE marking can be traded freely throughout Europe. The EN standard is a guideline for compliance with European regulations. Only a well-considered deviation from this directive can be made. CE marking is currently not mandatory for fire doors. The European Commission may initiate a procedure to oblige the CE marking by citing an EN standard in the Official Journal of the European Union. In 2015, the European Commission cited the standard EN 16034: 2014 for fire and smoke protection of building materials in the Official Journal. This set in motion a three-year coexistence period from 1 September 2015 in which manufacturers of fire doors can adapt to the new standard and member states can implement the European regulations. During this period they can also apply the CE marking to their certified products, without the marking being mandatory. National standards are transcended after the coexistence period. This means that national standards that conflict with the EN 16034-1 standard have to be withdrawn by the member states before 1 September 2019. Stricter standards in certain member states remain valid for this specific member state. If the coexistence period ends on 1 September 2019, every fire door must basically be provided with CE marking. 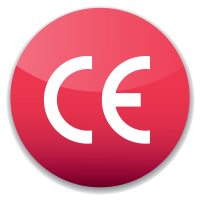 In order to sell fire doors in Europe, they must have a CE marking and manufacturers must be able to demonstrate this with a CE Declaration of Conformity. By drawing up this declaration, the manufacturer assumes responsibility for the conformity of the product. On top of that, the manufacturer has to mention if the product is CE marked on the declaration of performance (DoP). This declaration must be supplied with products if a harmonized European standard applies. The scope and performance of a product are indicated in the DoP. The CE marking is not applicable for the EN 16034-1 standard only. This standard must be combined with another standard that applies to the fire door. The standard for internal pedestrian doorsets: EN 14351-2 is still in the design phase, as a result internal pedestrian doorsets cannot yet have a CE marking from 1 September 2019 onwards. Normally a manufacturer provides a CE marking on its own product and does not need to prove whether the product meets the regulations of the CE marking. If it appears from practice that the product does not meet the requirements, it will be checked whether the product complies with European regulations. In the case of fire doors, on the other hand, it is checked annually whether the fire door is produced as indicated.